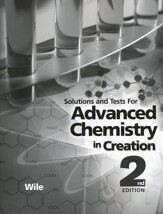 Deepen your understanding of Chemistry with Apologia's Exploring Creation with Advanced Chemistry, 2nd Edition. 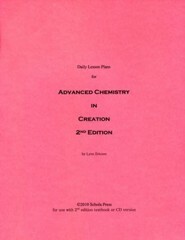 This rigorous course covers stoichiometry (with limiting reactants), thermodynamics, kinetics, acids and bases, redox reactions, solutions, atomic structure, orbital hybridization, molecular orbitals, molecular geometry, chemical equilibrium, and nuclear chemistry. An introduction to organic chemistry is also included, focusing on the major functional groups, organic nomenclature, and polymer chemistry. 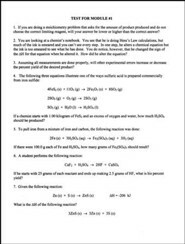 28 hours of lab exercises are provided, including the rate of an iodine clock reaction, distillation, chromatography, the common ion effect, measuring pH changes in a buffer, the electrolysis of copper sulfate, polymerization experiments, and the hydrolysis of sucrose. When a student has finished this course (designed to be taken after a college-prep course), he or she will be prepared to take an AP or CLEP exam. Color illustrations help keep concepts clear, while study questions, laboratory exercises, module study guides, and extra practice problems ensure that concepts are properly understood, and may be practically applied. 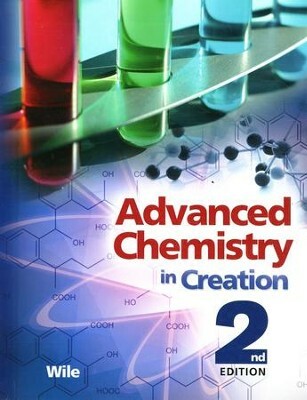 Prerequisites: Algebra II and a Chemistry college preparatory course such as Exploring Creation with Chemistry. 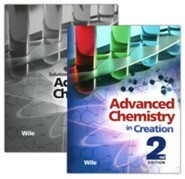 I'm the author/artist and I want to review Advanced Chemistry in Creation 2nd Edition Student Text.